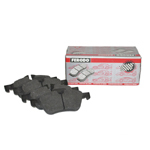 Ferodo DS2500 club race pads for the front of the 2004-2007 Subaru WRX STi. Ferodo DS2500 is a club race pad that can be used on the street and for light track use. This compound produces some noise on the street, but retains good cold friction, and has an MOT of around 1,000 degrees F. It also has 35% less compressibility than competitive products, giving it very good pedal feel and modulation characteristics. DS2500 has an average friction level of approximately (0.50) which remains constant at any speed, and at any temperature up to 1,000° F.